‘Tis the season for comfort food! 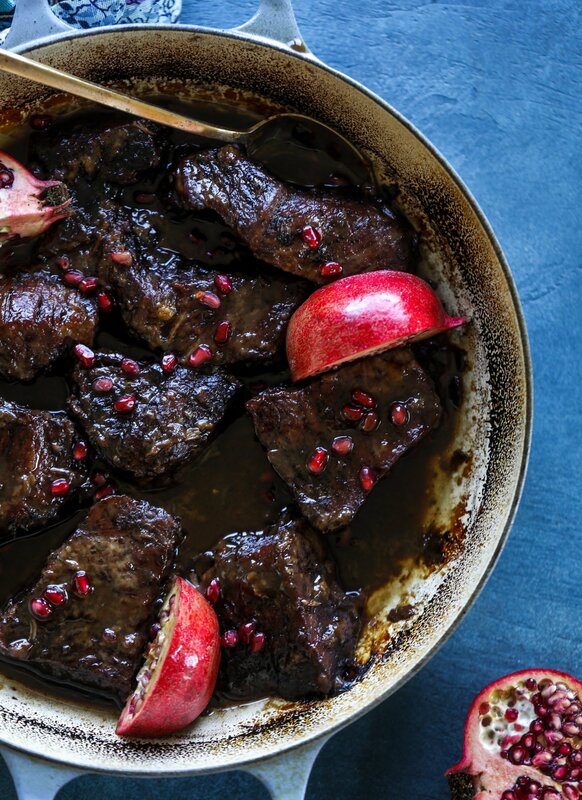 And I’m really starting to ring in said season with pomegranate short ribs. Why have I waited so long to make this? Yes I like pumpkin season. Yes I LOVE apple season. But I really adore pomegranate season. It’s mostly because pomegranates look like little autumn jewels and are just SO pretty (and the perfect edible décor) but also because their bright tart flavor is delicious. I love that they can go sweet or savory. I mean, that’s my THING. You guys know that I usually do my short ribs in the slow cooker. I can’t be bothered with things like that that are tricky and take forever in the oven, because the minute I put it in the oven I’m convinced that I have to leave the house for some unimportant reason. While I still think that the slow cooker is an awesome option (because you really can set it and forget it), braising them right in the oven is excellent too. You get the same super tender, juicy, rich result. And it wasn’t as difficult as I thought. And it didn’t take ten years! This might be my go-to preparation for short ribs from now on. I’m into it. For the liquid base before braising, I used a bit of pomegranate molasses and some pomegranate juice. The combination it so good. I find that it really adds depth of flavor to the ribs. Rich, a bit tangy, some sweet – it has everything. And better yet, you don’t need booze. Most of the other short rib preparations I share use a red wine base. I wanted to try a version without using alcohol for braising and I am thrilled with this result. And speaking of the actual ribs, I used boneless short ribs and might never go back to bone-in. These were so easy and gave us a lot of meat, whereas I find that using the bone-in ones often leave you with scraps of beef. There was so much flavor here! I suggest asking the butcher to freshly cut a few pounds of boneless short ribs and you won’t believe how great they are. What the heck to serve it with? I made a batch of my mascarpone polenta and, well, that was a freaking dream. Eddie was in HEAVEN. You could also serve it over grits or regular mashed or sweet potatoes. You could also put it in tacos! Go-to fall meal right here, for sure. 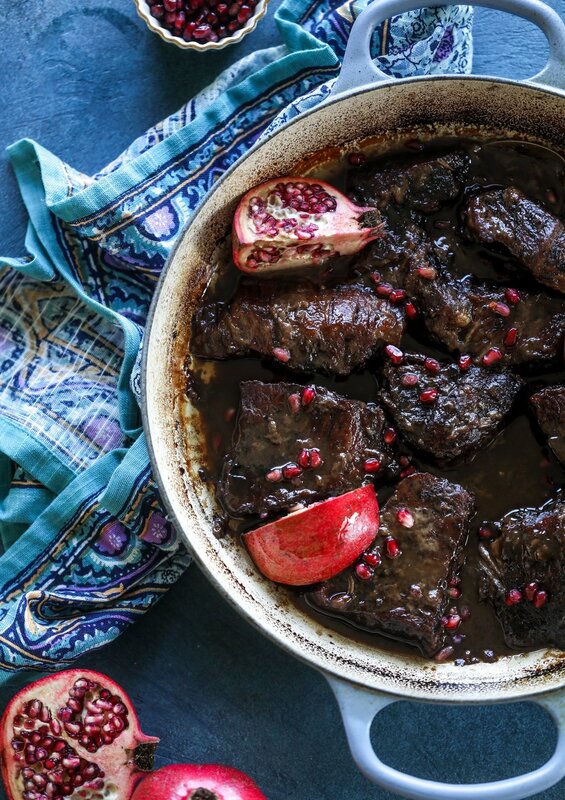 These pomegranate braised short ribs are an incredible take on comfort food! 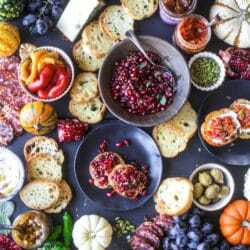 Pomegranate juice and molasses are the base of the recipe and after braising, you're left with tender, juicy and flavorful beef that is amazing served with polenta, potatoes or even in tacos. I suggest making a mascarpone polenta, gouda grits or use them for tacos! Make sure the short ribs have been out of the fridge for about 30 minutes to take some of the chill off. In a bowl, whisk together the flour, salt and pepper. In another bowl, whisk together the pomegranate juice and pomegranate molasses. Heat a large oven-safe pot (that has a lid!) over medium-high heat. Add 1 tablespoon of canola oil. Dredge each short rib through the flour mixture, coating on all sides. Place it in the pot and sear on all sides until golden brown - just about 1 minute per side. You can do this in batches if necessary and add a touch more oil if needed. You don't want a ton of oil because you don't want the ribs swimming in it. Once the ribs are seared and all in the pot, add the pomegranate juice mixture. Cover the pot and stick it in the oven. Braise for 2 1/2 to 3 hours. After 3 hours, the ribs should be tender and falling apart. You can garnish them with some pomegranate arils if you'd like! I love to serve these with polenta, mashed potatoes or sweet potatoes! I want everything to be this color. Such a hearty, fabulous dish to display those little edible rubies. yesss rubies, they are the best. Are you going to address the shooting in Pittsburgh? hi laura, i addressed it n social media right after it happened. it’s horrific. comfort food season is the best season! Where do you find pomegranate molasses? My local store doesn’t seem to carry it! This looks a.mazing. Do you have any suggestions for making it gluten free? I have the same question! Any GF tips? Would GF “flour” work? This recipe is the best I’ve tasted so far!! This is the best explanation of how to make this food! Yes, please! 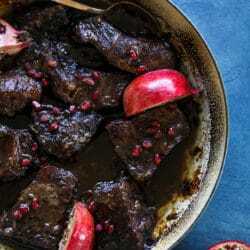 I love both short ribs and pomegranates so much! Beautiful impressive dish. I used pomegranates from my trees. Made this last night for friends that were affected by the Woolsey fire. They had some property damage and had to throw all their food out in fridge and freezer after electricity being off in their home for days. Perfect comfort food. Even my husband raved about it this morning. I almost regret sending leftovers home with my friends! Will make again over the holidays. This is a pot of flavor. My husband went nuts for this! Delicious! I might add another tablespoon of pomegranate molasses next time to up the flavor even more. Served it with grits.